1. All of the items raised at previous Environmental Management Committee meetings that required actions or follow-ups have been completed and reported to the Committee at or prior to the 10 November 2010 meeting, so have been removed from the list. As there were no items for Action arising from that meeting, there is no list of follow-ups. 1. That the Environmental Management Committee receives the report “Action Items from Environmental Management Committee Meetings”. The following is a list of items raised at Environmental Committee meetings that require actions or follow-ups. All action items indicate who is responsible for each action, when it is expected to be completed and a brief status comment for each action. Once the items have been completed and reported back to the Committee they will be removed from the list. · Number 2 on the table – Te Awa Structure Plan comment re four wellbeings not being adequately considered. Email Councillors re what comment was made and the basis for making it. · Information on s36 charges to be provided to Councillors in hard copy to inform the workshop scheduled for 23 February and annual plan adoption at 16 March Council meeting. 1. The Government has released the Proposed National Policy Statement on Indigenous Biodiversity (“NPS”) and has invited submissions. 2. This paper presents an overview of the NPS’s key features and proposes a submission be lodged before the closing date of 2 May 2011. 3. The NPS sets out the objectives and policies that are “intended to guide decision-makers in drafting plan provisions that recognise and protect biodiversity values, and in making decisions under the Act in respect of activities that may affect indigenous biodiversity”. The NPS applies to land owned by any person, with the exception of public conservation land, and land in the coastal marine area. 4.4. Help decision makers appropriately balance the protection of biodiversity, the interests and values of tangata whenua, the rights and responsibilities of landowners and the broader national interests that may be at stake in future resource management decision-making. 5. The role of the NPS within the RMA decision-making framework is that it is a relevant consideration to be weighed along with other considerations in achieving the sustainable management purpose of the Act. Recognising that the economic, social and cultural wellbeing of people and communities depends on, amongst other things, making reasonable use of land. 7.6. Consultation with landowners, the public and tangata whenua. 8. A draft of Council’s submission on the NPS is attached to this paper. During the preparation of this submission Council staff have liaised with Hastings District Council and with other regional councils to gauge a spectrum of views on the NPS within local government. 9. The Minister for the Environment, as he is entitled to, is using the powers granted to him under the 2009 amendments of the RMA and will make the final decision on the NPS without the hearing of submissions through a Board of Inquiry process. There is no opportunity for Council to present its submission in person. 10.1. Sections 97 and 98 of the Act do not apply as these relate to decisions that significantly alter the service provision or affect a strategic asset. 10.2. Sections 83 and 84 covering special consultative procedure do not apply. 10.3. The decision does not fall within the definition of the Council’s policy on significance. 10.4. The persons affected by this decision are also entitled to make a submission on the National Policy Statement. 10.5. The options considered are to make a submission on the Proposed National Policy Statement, or to not make a submission. 10.6. Section 80 of the Act covering decisions that are inconsistent with an existing policy or plan does not apply. 10.7. Council can exercise its discretion under Section 79(1)(a) and 82(3) of the Act and make a decision on this issue without conferring directly with the community or others having given due consideration to the nature and significance of the issue to be considered and decided, and also the persons likely to be effected by or have an interest in the decisions to be made. 2. Agrees to lodge the attached submission to the Minister for the Environment, subject to any further amendments arising at the meeting. 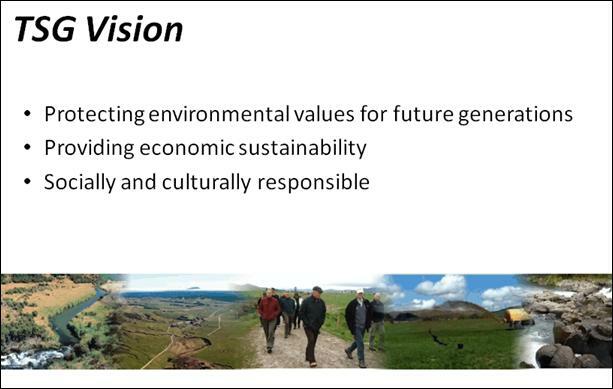 Council submits that a strong statement of the national values of biological diversity(a vision) should be included in section 5 of the Proposed NPS to support decision makers. The only objective in the NPS is “to promote the maintenance of indigenous biological diversity.....” (our emphasis). While Council supports the intention of the objective it is arguable whether or not the term “promote the maintenance of” will be very effective, but without a strong statement of national values it will be difficult to measure its success or otherwise in any event. Policy 5 requires local authorities (in addition to plan changes) to ensure “no net loss” of biodiversity of areas of significant indigenous vegetation and significant habitats of indigenous fauna. This policy will have the effect of requiring councils to consider the concept of biodiversity offsets, generally a concept not widely understood or used by many councils. This Council is concerned about the effectiveness of biodiversity offsetting given the lack of success of this method documented internationally. We believe that any increased emphasis on offsetting (as in Policy 5 and Schedule 2) must be accompanied by guidance and training, especially in relation to procedural application by council staff. We do consider, however that the proposed process for managing effects (first avoid effects, then remedy, then mitigate and only then offset residual effects) offers some certainty around the management process, and we support the retention of this. We note that the exclusion of Department of Conservation land from the NPS may create perverse outcomes, but also recognise that habitat loss which the NPS is essentially trying to manage is mostly occurring outside the DoC estate. 13. Thank you for the opportunity to lodge this submission. We would be happy to provide any further clarification or assistance prior to the Minister’s final consideration of the NPS, if that was appropriate. 1. This paper presents an outline of progress on a number of the plan changes currently being prepared. This paper should be read in conjunction with two separate reports elsewhere in this agenda relating to on-site domestic wastewater and the Taharua project. 2.3. proposed Regional Coastal Environment Plan (RCEP). 3. While all changes have implications for management of the region’s natural and physical resources, changes to the RPS are much more influential given other agencies (territorial authorities in particular) must give effect to the RPS’s direction in district plans and land use consent decisions. 4.6. RCEP Variation 1 – rivermouth hazard areas. 5. Separate papers in this agenda (Item 9: Domestic wastewater and Item 10: Taharua Strategy) provide similar updates on those plan change workstreams. 6. Councillors will recall approving 2010/11 budget for two new staff to assist with freshwater flows and allocation plan change project. Recruitment commenced last July/August and one position was filled in November. It was decided at the time to use unspent salary budget to engage a contractor to help us progress the 2010 Regional Water Symposium and to facilitate the development of the Regional Water Strategy, particularly the newly formed ‘Reference Group’ approved by Council in February 2011. 7. We have recently readvertised the position of Senior Planner. There were few applications. This position is critical to the delivery of the plan changes by the tight timeframes as determined by the consent expiry dates so it is important that the right person is recruited. 8. Two meetings have been held to date as per the project plan. The reference group has considered vision statements, guiding principles, evaluation criteria and has drafted objectives under the working themes of Regional Governance, Water Allocation, Water Demand and Supply, Water Quality, Economy and Water Science, Information and Investigations, and Communication. The second meeting looked at revised objectives, policy approaches and possible actions for Regional Governance, Water Allocation and Water Demand and Supply. 9. A number of issues have been raised by the Reference Group to date. 10. Concern has been expressed that the focus in on water allocation and while they understand that Council will be looking at Land Use and Water Quality following this process, they are finding it difficult to separate out water quality. 11. A number of group members are finding the process rushed with many issues needing to be discussed and not enough time being provided to enable full discussion. Other indicate that the group needs to narrow its focus on key water allocation issues. They have confirmed that the length of the meeting is appropriate but need more of them. They recognise however that many members made themselves available because the four meeting time commitment was reasonable. 12. Council recognises that the four meetings do not necessarily represent the end of engagement with stakeholders, given the ongoing land use and water quality discussions and the development of policy provisions for the statutory resource management planning documents. Water allocation is the critical element of that policy development hence the need to focus on water allocation at this point of time with the stakeholders who make up the reference group. 13. We also recognise that the members need to feel that the time they are giving is worthwhile and not a waste of effort. 14. There is also a recognition that the level of knowledge of the participants with respect to water management issues and the knowledge of our water resources is different. 15. In response, the next meeting includes a number of presentations on water allocation issues in Hawke’s Bay and on the basic hydrology of our river and groundwater systems. It will also provide an update on the Council’s storage project. To progress meaningful discussion, we have put forward a Proposed Water Use Strategic Framework for discussion at the next meeting. 16. We will continue to be flexible about whether additional meetings may be required beyond the four that have been scheduled. 17. Where possible relevant water management policies will be included in the Growth management and Infrastructure section of the Regional Policy Statement changes proposed for notification in October. 18. July 2012 remains the date for notification of plan changes relating to Tukituki and Karamu catchment freshwater flows and allocation. This timing is purposefully targeted in order to have provisions in place for resource consent renewal processes in those catchments. A failure to recruit adequate staff or consultancy resources represents a significant risk to the delivery within that time frame. 19.7. Giving effect to national policy statements where relevant. 20. Preliminary drafting is progressing well. This has been assisted by the effort invested in HPUDS. Arrangements have been made for a consultant to continue progressing this work while a senior planner is on maternity leave from April. Next steps will include engaging with TLA and iwi stakeholders about the form and direction of the RPS amendments. 21. Given the recent approval of the Triennial Agreement, ‘principles’ apply to how and when the regional council engages with territorial authorities on proposals to change the RPS. Those ‘principles’ include working together in good faith; supporting establishment of communications and collaboration to enhance performance of local government in the region; collaboration and cooperation should be strived for, but local solutions for local issues may still apply; and early involvement of TLAs in proposals that will affect them. Obviously, the principles will be observed during further preparation of the ‘Growth Change’ plus associated domestic wastewater and urban stormwater changes. 22. October 2011 remains as the intended date for notification of a bundle of plan changes relating to growth management and infrastructure, and related changes for domestic wastewater and urban stormwater discharges. This means staff are aiming to present a first draft plan change document to a committee or Council meeting in July. 23. A plan change dealing with stormwater has been ‘on the books’ since 2004 when the Council decided to withdraw new stormwater provisions from the then proposed RRMP. In mid 2009, the Council endorsed establishment of a collaborative stormwater working group to work through a number of ‘sticky’ unresolved issues before commencing the RMA’s formal plan change submission process. 24. The stormwater working group met for the first time in August 2009. The Group consisted of representatives from each territorial local authority, Fish and Game Hawke's Bay, Department of Conservation and a cultural representative nominated by the Maori Committee Chairman. The Group’s purpose was to develop an agreed approach to stormwater management and produce a Regional Stormwater Strategy. 25. The Group met initially to definitively identify regional stormwater issues. The Group agreed that stormwater discharges do impact the receiving environment in terms of water quantity and water quality and general ecosystem functioning. Attachment 1 highlights a number of stormwater issues that the draft Regional Stormwater Strategy proposes to address. 26. To date, collaborative work has resulted in the production of a draft Regional Stormwater Strategy and a complementary series of implementation methods. The Group has agreed in-principle to the objectives, key principles and implementation methods but has yet to formally sign-off on the Strategy. Currently, Council staff are engaging with regional taiwhenua groups to ensure Maori are informed and to seek support for the Strategy’s vision and objectives. The Strategy is intended to be completed by June 2011. 27.1. Changes to the RPS associated with growth management and integration of infrastructure. 27.2. Changes to regional plan policies and rules associated with effects (quality and quantity) of stormwater discharges. This would apply to the RCEP and also regional plan parts of the RRMP. 28. These two ‘layers’ are linked, but it is not essential that their processes are synchronised. The RPS changes are anticipated to be generic to many types of infrastructure - not only stormwater systems, whereas the regional plan policies and rules would be more specific. Regional plan policies are anticipated to include such things as clearer decision-making criteria on stormwater discharge consents and associated rules, plus clearer definitions. 29. The recent resource consenting process for Hastings District Council’s urban stormwater network discharges was determined on the basis of the RRMP’s existing rules and policies. In that instance, the applicant had proposed many initiatives (particularly the preparation of ‘catchment management plans’) that were ultimately embodied in the consent conditions. The Hearing Panel of three commissioners included a range of additional consent conditions. 30. While that consent process was not without its challenges from plan interpretation and plan implementation perspectives, the commissioners’ decision indicates that the current regional plan policy and rule framework was able to facilitate an acceptable outcome from consent staff perspective. 31. Consent applications for stormwater discharges are currently being prepared by other territorial authorities and staff are confident that the current policy and rule framework is adequate. 32. That is not to say that processes could not be further assisted by clearer plan definitions and policies. These elements are being focussed on by staff drafting changes for regional policies and rules, as opposed to being tackled within the RPS ‘layer’ of changes. 33.2. notify a change to the regional plan’s stormwater provisions after the RPS (growth) change has proceeded through submissions. 34. There is merit in both timings, but in terms of managing staff workload through the formal part of the planning process (responding to public enquiries, summarising submissions, identifying individual submission points, preparing documentation for the further submission process, preparing officer reports and the associated administration that goes with that), staff recommend notifying the RPS components first, and then the notifying the regional plan provisions once it is clear what the issues may be on the stormwater related provisions of the Regional Policy statement. 35. The regional plan changes are also complicated by the need to make changes in both the Regional Resource Management Plan and the Regional Coastal Environment Plan and that can significantly increase the administration of the process. 36.3. Rules for stormwater discharges. 37. Negotiations are continuing on these remaining matters with the appellants (Napier City Council, Minister of Conservation and Ngati Kahungunu Iwi Inc). Staff anticipate further Environment Court mediation in the coming months will be required to assist resolving matters, particularly those in Napier City Council’s appeal. In the meantime, staff will continue negotiating with Napier City Council at various staff and political levels to resolve that appeal as swiftly as possible. 38. One appeal (out of three) has been resolved in its entirety on the air quality plan change. Negotiations are continuing on the remaining two appeals. Resolution of the appeal by Napier City Council will be aided by the Government’s review of the PM10 NES anticipated to come into effect in April/May. Again, staff anticipate further Environment Court mediation in the coming months will be required to assist resolving the two remaining appeals by Napier City Council and Solid Energy Limited. 39. The period for lodging submissions and further submissions on Variation 1 has closed. 28 submissions were received, and there were no further submissions made. Hearing date(s) will now be scheduled (likely mid/late 2011) and officers will prepare reports and recommendations on the submissions received. It is intended that this matter will be heard by the Hearings Committee. 40.1. Sections 97 and 98 of the Act do not apply as these relate to decisions that significantly alter the service provision or affect a strategic asset. 40.2. Sections 83 and 84 covering special consultative procedure do not apply. 40.3. The decision does not fall within the definition of the Council’s policy on significance. 40.4. The persons affected by this decision in relation to timing of the regional plan change for stormwater are those persons will have the opportunity to make submissions on all of the plan changes once those changes are publicly notified. 40.5. The options considered in relation to the regional plan change for stormwater are to proceed and (1) notify changes to the RPS (growth) and regional plans (stormwater) at the same time; (2) notify a change to the regional plans’ stormwater provisions after the RPS (growth) change has proceeded through submissions. 40.6. Section 80 of the Act covering decisions that are inconsistent with an existing policy or plan does not apply. 40.7. Council can exercise its discretion under Section 79(1)(a) and 82(3) of the Act and make a decision on this issue without conferring directly with the community or others having given due consideration to the nature and significance of the issue to be considered and decided, and also the persons likely to be effected by or have an interest in the decisions to be made. 3. Agrees that public notification of stormwater-related provisions be staggered, with the Regional Policy Statement (growth and infrastructure) provisions to be notified in October 2011 and the regional plan provisions notified following analysis of submissions received on the RPS change. The following table highlights a number of generic stormwater issues that the Stormwater Strategy seeks to address. Risk to human life and other life. 1. Council has identified several issues regarding the current rule structure pertaining to on-site wastewater discharges. It is proposed that a number of individual plan changes that cover a range of issues including wastewater within the Regional Policy Statement (RPS), Regional Resource Management Plan (RRMP) and the Proposed Regional Coastal Environment Plan (PRCEP) be notified in October 2011. These plan changes deal with the strategic integration of land use and infrastructure. Staff believe that an additional limited scope plan change should be notified in early July to deal with some more pressing, but less contentious, issues with the on-site wastewater rules of the RRMP and PRCEP. 2. The need for an improved policy framework for wastewater has been recognised for some time. The existing rule framework was developed in the late nineties to address an emerging problem with un-serviced subdivision in fringe areas. There had been a permitted activity rule relating to on-site wastewater discharges in the preceding Water Resources Plan but it did not target development in fringe areas. The on-site wastewater rules in the RRMP remained unchanged through the hearing and decision process, and therefore are as they were first proposed on 15 April 2000. 3. In January 2002 the sewage on-site group (SOS), comprised of TLA’s and professionals working in the wastewater industry, requested guidance about the meaning of the phrase ‘zoned for residential activity’. A table detailing those zones that were considered to fit within this definition was developed and agreed on by the SOS group, but there has been ongoing frustration with the ambiguity of condition (d) of Rule 37 for some time. 4. Another driver for this proposed limited scope plan change is the increasing number of resource consents. In 1999 when Rule 37 was drafted there were 10 resource consents issued by Hawke’s Bay Regional Council for wastewater discharges. There are now over 530 discharge permits issued by the Regional Council. Staff now consider that the level of regulation imposed by parts of this rule are no longer appropriate. 5. On-site wastewater consents have generally been issued for a duration of 10 years. A large number of the resource consents that were required through the introduction of the current rule framework in early 2000 are now expiring, and the difficulties of the current rule framework with regard to renewals have become apparent. 6. The Council has long been aware of the need to progress a wastewater plan change. Papers bought to the Council in recent times have outlined the proposed accreditation scheme which is intended to streamline both the consenting and the compliance process for ‘accredited installers’; and the proposed two category approach for processing replacement resource consents that make a distinction between low risk and high risk discharges. 8. As a result of the broad nature of these plan changes, they are likely to take some time to proceed through the process and become operative. The limited scope plan change proposed in this paper will address a significantly smaller range of issues, and focus solely on changes to rules, and will therefore progress through the plan change process and become operative significantly faster. 9. Before any plan change process is embarked upon it is first necessary to define the problems that it is intended to address. The two particular aspects that require attention are interpretation and an appropriate level of regulation. 10. The current interpretation of condition (d) of Rule 37 of the RRMP is that ‘any land zoned for residential activity’ includes rural residential properties. Rural residential properties can be large properties with a large amount of land (e.g. 5000 m2) suitable for wastewater discharge, or conversely large lots with a building platform and the remainder of the section steeply sloping land that is unsuitable for on-site wastewater disposal. The current drafting of the rule does not provide any definition of what ‘any land zoned for residential activity’ is, and current interpretation of the rule relies on the zone ‘name’ of the property as defined in the relevant district plan. 11. This condition adopts a risk based approach, but is limited in the risk factors it takes into account. In some instances properties over 3000 m2 of flat to rolling topography with well drained soils require resource consent simply because they are zoned rural residential, despite complying with all other conditions of Rule 37 as it is currently drafted. This is an unintended consequence of the rule structure. 12. In townships such as Waimarama and Haumoana the installation of a new wastewater system requires a resource consent. Most existing on-site wastewater systems have no consent, and therefore Council has no information about how well these systems are performing. Anecdotal evidence suggests that some existing wastewater treatment systems are not treating wastewater to a suitable standard. 13. The suitability of the current level of regulation is shown to be questionable when people who were required to get resource consent to install their on-site wastewater treatment system, and have installed it since April 2000 are required to replace their resource consents. The current rules classify any wastewater treatment system installed since 15 April 2000 (the date the Regional Resource Management Plan was notified) as a ‘new’ wastewater system which is subject to the conditions of Rule 37 of the RRMP, and Rule 27 of the PRCEP, rather than Rules 35 and 26 respectively. 14. Until recently people have been required to pay a deposit of $1125 (excl GST) when they lodge their replacement resource consent application. This is a large sum of money and can seem unjustified to an applicant when their neighbour has an on-site wastewater system that produces effluent of a poorer quality, and has never had to pay to consent the discharge from it. 15. The larger issue of inequity with regards to consented and unconsented wastewater systems within communities is considered to be better addressed through the proposed changes to the Regional Policy Statement and the objectives and policies of both plans, scheduled to be notified in October. Staff consider it appropriate to rectify the issues raised above through an additional plan change. This limited scope plan change would focus solely on the rule framework of the RRMP and PRCEP and be notified in early July 2011. 16. To address the problems identified, changes are required to the rules of both the Regional Resource Management Plan and the Proposed Regional Coastal Environment Plan (version 2.2). 17. Staff propose only to draft changes to rules 35, 36 and 37 of the RRMP and rules 26, 27 and 28 of the PRCEP through this plan change process. A marked up draft of suggested amendments to the relevant rules of both the RRMP and PRCEP is attached as Attachment 1. 18. Rules 26 and 27 of the PRCEP to which changes are proposed are no longer under appeal and have been operative since January 2011, however there is one outstanding appeal on rule 28 of the PRCEP. 20. Section 14 of the Resource Management (National Environmental Standards for Sources of Human Drinking Water) Regulations 2007 requires a condition to be inserted to ensure discharges upstream of registered drinking water supplies are policed. In addition to changes required to address the issues outlined above, this condition needs to be included in all relevant rules amended as a result of this plan change. 21. It is proposed to address the problem definition outlined above by essentially permitting all discharges from individual on-site wastewater systems to land, except on sites where they may pose a potential risk to the environment. 22.4. Located in an area that experiences high seasonal groundwater levels (within 600 mm of ground level). 23. The setbacks already prescribed in the relevant rules (1.5 m from a property boundary, 20 m from any surface water body, 20 m from the coastal marine area and 30 m from any bore drawing water from an unconfined aquifer) are proposed to be maintained. 24. Of particular concern is the protection of existing groundwater and surface water quality, as well as potential nuisance effects of on-site wastewater discharges on neighbours. 25. Staff believe that the proposed amendments allow an effects based approach to be adopted, based on the level of risk that potentially exists on a particular site. The current rule structure is a very blunt approach which relies on the location of lines on district planning maps. It doesn’t take into account the size of the property or the slope of the property which are both factors that can effectively mitigate, or alternatively increase the adverse effects of an on-site wastewater discharge. 26. The proposed amendments to the 600 mm separation distance from groundwater condition recognise that if a 600 mm separation from ground level to the highest groundwater level cannot be achieved, then a raised bed has to be constructed to achieve this separation. Raised beds require appropriate design and ongoing maintenance and monitoring to ensure that they continue to operate effectively. They are exactly the type of on-site wastewater systems that should be consented to allow their ongoing performance to be assessed. 27. Given that Council Staff assess proposed designs against the recommendations of the Australia New Zealand Standard for On-site domestic wastewater management (AS/NZS 1547: 2000) it is considered appropriate to formally acknowledge this. There is an updated standard pending however, so reference to a particular version of the standard was not helpful and inclusion of the relevant design requirements in the plan a better long term option. This has resulted in the proposed changes to Figure 6 of the RRMP, and inclusion of a similar diagram in the PRCEP. 28. A condition has also been included in rule 37 of the RRMP and rule 27 of the PRCEP that requires systems to be designed in accordance with the requirements of Figure 6 which is based on the recommendations of AS/NZS 1547:2000. This was considered necessary because any on-site wastewater systems that have not been designed in accordance with the recommendations of the standard need to be assessed for their suitability for the proposed site. These designs are pushing the boundaries of appropriate design and if not checked could result in discharges that have adverse environmental effects. 29. There seems little point in requiring people who are regularly maintaining their systems, and have not modified them in any way, to seek replacement discharge permits unless they are located in an area of high risk, such as over the Heretaunga Plains unconfined aquifer or in a location with high groundwater levels. 30. The ongoing discharge of on-site wastewater via spray irrigation is no longer considered to be a sustainable method of wastewater disposal due to potential adverse health effects. A condition has therefore been included in the permitted activity rules to ensure that consent holders who still utilise this method of irrigation are required to seek a replacement consent. One of the conditions of the replacement consent would require the installation of sub-surface irrigation within a set period of time. 31. It is acknowledged that the proposed rules rely on an assessment of slope angle, and a calculation of the loading rate on the site. The assessment of slope angle relies on someone with the appropriate equipment and understanding to take a measurement. This fortunately coincides with the new accreditation scheme that the compliance team have scheduled to begin roll out in July 2011. The introduction of the accreditation scheme will create a greater incentive for members of the public to use an accredited designer/installer. The Council can educate the designers/installers about the right way to measure slope and calculate the proportion of net site area to discharge volume, and then through the proposed random audit process check these things. 32. Staff propose to consult with Councillors, territorial local authorities (TLAs), iwi and industry representatives (represented through the sewage on site (SOS) group prior to the plan change being notified in an effort to try and limit the number of submissions that this plan change attracts. 33. If Council supports the idea of a limited scope plan change, in addition to the broader plan changes for strategic integration of landuse, staff propose to prepare a draft plan change and brief this Committee at the meeting on 15 June 2011. 34.1. Sections 97 and 98 of the Act do not apply as these relate to decisions that significantly alter the service provision or affect a strategic asset. 34.2. Sections 83 and 84 covering special consultative procedure do not apply. 34.3. The decision does not fall within the definition of the Council’s policy on significance. 34.4. The persons affected by this decision are those persons who have on-site wastewater treatment systems. 34.5. The options considered are continuing with the current rule framework and including the proposed plan changes scheduled to be notified in October 2011, or progressing a plan change of limited scope that deals only with amendments to the current rule framework. 34.6. Section 80 of the Act covering decisions that are inconsistent with an existing policy or plan does not apply. 34.7. Council can exercise its discretion under Section 79(1)(a) and 82(3) of the Act and make a decision on this issue without conferring directly with the community or others having given due consideration to the nature and significance of the issue to be considered and decided, and also the persons likely to be effected by or have an interest in the decisions to be made. 2. Instructs staff to prepare a draft PRCEP and RRMP plan change to address on-site wastewater issues, consult with Sewage on Site (SOS) group and TLAs and present the draft plan change to the 15 June 2011 Environmental Management Committee meeting. 1. This report provides a progress update on Council’s Taharua Policy Development Strategy (November 2009) to address water quality issues in the Taharua and upper Mohaka rivers. This builds on the previous update to the Council in November 2010. 2.6. Next steps and proposed amendments to notification timeframes. 3. It would be helpful to get an indication from the Committee as to whether the provisional water quality targets and timeframe might be acceptable and that the policy options which staff are investigating are appropriate. 4. The TSG has met twice since the last Council update in November 2010. 5. Group progress has been somewhat constrained by development complications with the catchment nutrient model, intended to inform the essential link between river “health” and required catchment nutrient yields. However, Council staff have been able to suggest provisional water quality guideline levels, which the TSG have agreed in principle. Initial TSG discussions of policy options have taken place and some principles and areas of contention identified. 6. Council’s Taharua strategy emphasises partnership with the TSG to address water quality issues. The TSG vision, desired outcomes and values that were presented to Committee in November have informed the discussions of provisional water quality guidelines and initial debate on policy options. 7. The TSG vision and outcomes are included as Attachment 1. Figure 1 illustrates the “pillars” of the vision and outcomes. 8.5. Marked increasing trend in nitrogen measured ~ 55 km downstream at Glenfalls – correlates with land use change in the Taharua catchment. 9.4. Reduce downstream impacts to an absolute minimum. 10. To help meet these objectives, Council staff identified guideline levels that, if met, have the potential to offset the effects of land use change. 11.2. natural character guideline levels that identify the relatively pristine nature of the upper Mohaka River, such as identified by the Water Conservation Order (WCO). 12. A ‘nitrate toxicity guideline’ for the Taharua River of 1.7 mg/L (1700 mg/m3) of nitrate (NO3-) is proposed. This equates to a level of total nitrogen of ~ 1.83 mg/L (1830 mg/m3). 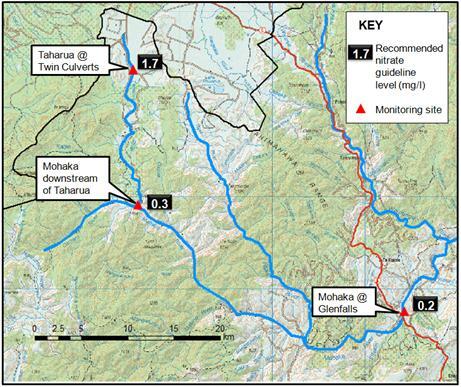 The guideline level is proposed for the Taharua River at Twin Culverts and thus provides protection for the lower, mid and upper reaches of the river. 13. The nitrate toxicity guideline is based on a detailed review by Hickey and Martin (2009) and aims to provide 95% species protection of aquatic animals. The review was commissioned by Environment Canterbury, and has been used for the New Zealand ANZECC review and as such is still relevant to Taharua/Mohaka. The guideline number is recommended for moderately disturbed systems, but provides a level of protection to mitigate the toxic effects of high nitrate levels on aquatic animals. Concentrations of nitrate below the guideline level are typical of the Taharua River in years prior to a marked reduction in the viability of the trout fishery that occurred around 2003/04, as identified by angling records. 14. A further level of protection (99% of species) of 1.0 mg/L (1000 mg/m3) of nitrate (NO3-) is suggested by Hickey and Martin for managing pristine environments but the recommended guideline level of 1.7 recognises the modified nature of the Taharua catchment. 15. A ‘natural character guideline level - upper Mohaka River below the Taharua confluence’ of 0.3 mg/L is proposed for total nitrogen. This value approximates the level of nitrogen currently measured at Glenfalls (~ 55 river kilometres downstream) over recent years. Glenfalls has good water quality with a high natural character and a limited occurrence of problematic algal growth. Achieving a comparable nutrient level in the Mohaka River directly downstream of the Taharua River should afford adequate protection to the Mohaka River but allows some increase in background nutrient levels. 16. A ‘natural character guideline level - Mohaka River at Glenfalls’ of 0.2 mg/L is proposed for total nitrogen. The value is typical of nutrient conditions measured at Glenfalls during the 1990’s prior to a marked increase in nitrogen from 2000 to the present time. Returning nutrient levels at Glenfalls to 0.2 mg/L would increase protection of the Mohaka River between the Taharua confluence and Glenfalls. The area upstream of Glenfalls is covered by the WCO. 17. At present, New Zealand has no information on the sensitivity of native fish species to nitrate levels (Hickey and Martin, 2009). However, Hickey and Martin (2009) make comment that some native invertebrate and fish species are more sensitive to some chemical contaminants than the standard test species included in their nitrate toxicity review. 18. In the absence of New Zealand specific data these guidelines are the most up to date and appropriate that we can utilise. Hickey is one of the lead scientists on the revision of the ANZECC guidelines and specifically toxicology limits. In this regard we can have confidence that the information is robust and been appropriately interpreted for New Zealand conditions. However, it is proposed that Council seek advice on the applicability of the guideline levels from the Hickey. It is expected we will have advice on the application to Taharua guidelines from Hickey within the next 2 weeks. 19. The guideline levels were provisionally agreed by TSG representatives at the 22 March meeting, along with a provisional timeframe of 15 years. This would require land management changes within 10 years, given a lag time of up to 5 years for nitrates lost from catchment land uses to reach the rivers. This timeframe may need to be reassessed once the scale of the task and economic implications are better understood. 20. The model commissioned from NIWA to examine the effects of Taharua land use on the Taharua and Mohaka Rivers is now available. A recent workshop with NIWA clarified model assumptions and improved use for policy development. The ‘nitrogen sub-model’ connecting land use with river nutrient concentrations provides a good fit with observed data. The ‘periphyton sub-model’ linking effects of nutrient concentrations and flow on algal biomass has encountered problems, but does not hinder policy development. 21.1. “Business as usual” is not an option. The current nitrogen (N) leaching load to the catchment is not low enough to achieve either water quality guideline. 21.2. All other land uses remaining “as existing’, dairy farms may need to be operating at around 24 kgN/ha/yr as a maximum to achieve the proposed nitrate toxicity guideline from Twin Culverts downstream. 22.2. Identify the best mix of farm mitigation options to achieve reductions in N leaching while optimising catchment profitability. 23. Detailed discussions with Landcare Research have taken place, but use of this economic model will require information from the NIWA nutrient model. Landowners have agreed to work cooperatively with the regional council and Landcare Research to ensure the model is robust and meets needs. This is likely to take a few months, unless fast-tracked by engaging consultants to do upfront data gathering. This would double costs from $20,000 to around $40,000. 24. An effective Taharua policy framework will require a range of complementary components. A range of possible options has been scoped and initially discussed with the TSG on 22 March. Options have been assessed against 8 criteria: Council’s initial resolution; TSG visions and goals (see Attachment 1); availability; contribution to outcome; oopposition; ccomplexity; risk; and cost. 25. The scoping exercise has identified the following range of options. Attachment 2 provides a more detailed summary. Careful selection and synthesis of options is needed to construct an effective and efficient framework. This process will continue at the next TSG meeting in late April. 26. The TSG has identified 3 guiding “principles” for a policy framework: maximum flexibility; results focussed; fair and equitable. 27. The TSG has also identified 2 main “sticking points”: the need for cost analysis; who should pay and how? 28. Likely policy directions are outlined below. This may evolve with nutrient and economic modelling and ongoing TSG discussions. 29. Effects based approach: the TSG continues to support Council’s approach that focuses on limiting nutrient outputs to achieve water quality targets, while maximising landowner flexibility. Most of the science is now in place to support this approach, recognising a need for ongoing monitoring in the next few years to reduce uncertainty. 30. Water quality targets and timeframe: the TSG provisionally supports the water quality guideline levels and indicative timeframes set out in Figure 2. An interim milestone (e.g. 5 years) could be considered. Development of complementary guideline values for clarity, habitat and biodiversity will need to be considered to give effect to the range of values identified by the TSG. This will be to ensure resilience and longevity to solutions enacted. 31. Reducing catchment nitrogen cap: a cap on cumulative nitrogen yield from all land uses is a minimum requirement to manage effects from the catchment as a whole. The TSG recognises that this cap will need to be reduced to ensure water quality targets. Many easier on-farm mitigations have already been used by dairy farmers to reduce from nitrogen yields from around 50 to 35 kgN/ha/yr. To reduce future yields will involve significant farm operational changes and costs. 32. While phosphorus is an important nutrient to manage, policy should seek to maintain existing good practice. 33. Discharge rights allocated to properties: a catchment-only cap would not provide enough certainty for stakeholders or Council. Fair and equitable allocation of nitrogen discharge rights among land users is highlighted by the TSG as a key principle and “sticking point”, exacerbated by the mix of catchment land users. There is no simple solution and all basic options have advantages and disadvantages. 34. Allocation based on averaging (“everyone gets the same per hectare”) or land use capability (everyone gets what their land is sustainably capable of”) may satisfy the “fair and equitable” test. A “needs tested” allocation on top could assist adjustment and economic sustainability. A composite arrangement is likely to be needed. 35. Poronui (6,500 ha) is unlikely to accept a cap that “locks” it at existing low nitrogen yields without compensation. Historically, Poronui had 3500 ha of sheep and beef, only recently moving into exotic forest. In short, the more freedom Poronui has, the more potential pain for dairy owners. Taharua landowners plan to meet among themselves to discuss possible ways forward. 36. Native vegetation (approx. 53% of catchment) could be capped at existing low nitrogen yields), providing a larger “pot” for productive land users and additional protection. 37. Nitrogen offsetting provision: provision for farmers to exceed nitrogen discharge allowances, if fully offset elsewhere in the catchment, would increase flexibility. A nitrogen trading scheme could create a market for individual surplus allowances, enabling Poronui and forestry owners to benefit from low nitrogen yield land uses. The feasibility of a formal or informal trading scheme needs assessment as: there are limited participants; set up and administration costs may be prohibitive; Taharua River “health” requires relatively even nitrogen concentrations; and a falling cap adds complexity. If trading is not an option, some other mechanism to accommodate landowner interests is needed. 38. 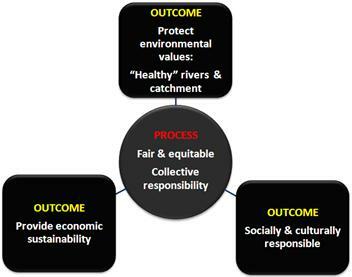 Policy suite for sustainable catchment management: a policy framework for nitrogen alone is unlikely to ensure future river “health” and sustainable catchment management. Plan policies should address issues such as: phosphorus management; riparian areas and wetlands; and soil retention and health. 39. Catchment entity and legal agreements: a collective entity with a performance-related contract to meet targets, could offer a range of benefits including ownership of the process by an engaged community and more integrated management to address the range of TSG values. The DairyNZ “club” model being developed with Rotorua farmers may offer a “package” that could be tailored for Taharua. 40. A collective approach is likely to depend on Poronui and dairy interests agreeing a way forward. Other considerations are: wider TSG involvement; costs of setting up a collective; the role of supporting regulation; and liability and enforcement issues associated with any delegation of powers. Potential benefits of audited self-management approaches are increasingly recognised in water allocation management. 41. Supporting regulation: effects-based rules can provide a necessary “backstop” to ensure time-bound progress to achieve water quality targets and prevent slippage. Permitted activity status for intensive farming, subject to performance conditions, may be acceptable to Council and landowners. Permitted status could be an incentive for membership of a collective entity. 42. Existing point source rules will need to be reviewed to complement an effects-based framework being developed. 43. Financial incentives/disincentives: Council’s existing Regional Landcare Scheme (RLS) grants have already contributed significantly toward reducing nutrient loading within the catchment. This scheme could be extended and/or additional grants made offered for on-farm mitigation works (linked to restrictive covenants). Loans or deferred rates are also an option and may be more acceptable to the wider Hawke’s Bay Community. Other forms of assistance can include: “tailored” monitoring to inform adaptive management and support for applied research or even land purchase. As Taharua Farm is for sale, the TSG proposes that Council explores a business case for purchase. 44. The TSG wants to know whether Council expects landowners to meet all the costs of nitrate reduction, whether it will continue the RLS, perhaps under extended criteria, and whether it would even contemplate land purchase as an option. 45. Action/implementation plan: the plan change should provide for a more detailed action/implementation plan. This can ensure a balance between flexibility to respond to uncertainty and a clear path forward. Issues such as riparian planting and wetland reinstatement/creation can be addressed in the action plan. 46. Other Mohaka sub-catchments: it has been identified that there are other sub-catchments within the Mohaka that could contribute to a decline on the water quality and ecology. Although the Ripia quality is good, landuse change could affect the Mohaka. The Waipunga (which flows in downsteam of Glenfalls) has been identified as having degraded in recent years. The effect on the Mohaka has yet to be investigated, although observations suggest a change in clarity and hue from its confluence with the Mohaka. Solutions for this sub-catchment will, if required, be cross boundary, as development is in the watershed of the catchment shared with Bay of Plenty Regional Council. 47. Securing future “health” of the Mohaka River would require risks of intensification in the Ripia and Waipunga sub-catchments to be addressed. The TSG also have concerns that Taharua improvements to the Mohaka may be offset from downstream sub-catchments. Further policy consideration is needed, but a holding arrangement may be appropriate. For example requiring consent for land use changes that increase targeted outputs. This would impact on land owners beyond the TSG. 48.4. Understanding Council’s level of commitment towards supporting different solutions (proposed Councillor field trip to meet TSG in May). 49. These steps are inputs into the policy framework. The policy framework in itself is complex, particularly if nitrate trading is part of the mix. 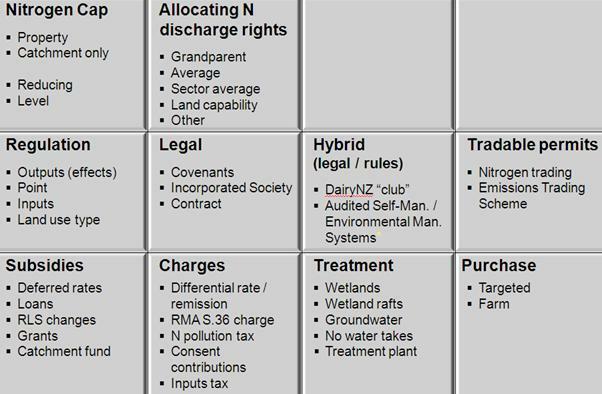 The idea of a catchment based entity also has significant ‘institutional type’ processes and protocols to be established and the costs of such mechanisms need to be weighed up against the benefits. It could be, for example, that if the landowners can agree on a final allocation of nitrate across the catchment that individual consents might be a more efficient mechanism. 50. Given the delay in the catchment model and the work still required, it is now unrealistic to expect that a fully developed set of policies and rules, with an RMA Section 32 cost-benefit analysis, can be prepared by the scheduled notification date (July). It is proposed that an interim step is to prepare a draft strategy document, which puts together the vision, values, objectives, water quality targets and timeframes, and likely mechanism for meeting those targets and timeframes, for informal consultation. This strategy document could be presented to the Committee in a couple of month’s time. In the meantime, work would continue with the catchment and economic modelling and cost-benefit analysis with plan change notification at the end of the year. 51.1. Sections 97 and 98 of the Act do not apply as these relate to decisions that significantly alter the service provision or affect a strategic asset. 51.2. Sections 83 and 84 covering special consultative procedure do not apply. 51.3. The decision does not fall within the definition of the Council’s policy on significance. 51.4. The persons affected by this decision in relation to timing of the regional plan change for the Taharua Strategy are those persons who will have the opportunity to make submissions on all of the plan changes once those changes are publicly notified. 51.5. The options considered in relation to the regional plan change for the Taharua Strategy relate to the timing of notification given the unavailability of critical information. Extending the time frame by 6 months to December 2011 will enable the required cost benefit analysis to be undertaken. The interim step of undertaking targeted consultation on the Draft Taharua Strategy will enable other stakeholders and interested groups to understand the development process supporting the final plan change. 51.6. Section 80 of the Act covering decisions that are inconsistent with an existing policy or plan does not apply. 3. Instructs staff to schedule a Councillor workshop to examine policy options in more detail. 4. Instructs staff to prepare a draft Taharua Strategy for informal consultation with other targeted stakeholders. 5 Approves the postponement of the notification date for the plan change to December 2011. Possible. As a starting point for dairy farms, but won’t achieve nutrient reductions. Not favoured by Poronui. Could apply to native vegetation areas. Possible. Simple approach to the “fairness and equity” issue. Adjustment period required unless nitrogen trading provision. Possible. Environmental logic, but LUC is not necessarily linked with nitrogen leaching potential. Economic implications need assessing. Essential? Council’s initially preferred approach reflects purpose and principles of RMA. Key is to design an agreed package and learn process lessons from other regional councils. Inappropriate. Both in terms outcomes and process. Poor fit with purpose and principles of RMA and TSG values, vision, and outcomes. Inappropriate. Both in terms outcomes and process. Poor “fit” with purpose and principles of RMA and TSG values, vision, and outcomes. An Incorporated Society with formalised objectives and rules of operation is an established means of creating a collective legal entity for catchment management. Must have 15 members (corporate body counts as 3). DairyNZ are leading development of a “catchment club” as a potential new way for Rotorua dairy farmers to ensure progress to water quality targets. The model would incorporate a collective charter and agreed performance contract with regional council. Preferential consenting arrangements could be an incentive for club membership. Possible. 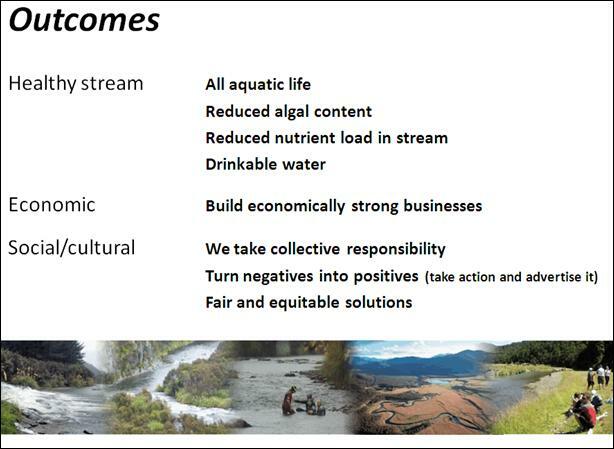 In development in Rotorua catchment. Appears to fit effects-based regulatory approach and acceptable to landowners. Bay of Plenty Regional Council staff recognise potential benefits for process and outcomes. Tailored package for Taharua? A nitrogen trading scheme could create a catchment market for buying and selling nitrogen discharge units as part of a “cap and trade” framework. It could increase landowner options. Possible. Could be a useful process “sweetener”. Repayment makes it more acceptable Hawke’s Bay ratepayers than grants. Possible. Targeted loans can assist collaborative process and secure wider benefits. Repayment makes it more acceptable to Hawke’s Bay ratepayers than grants. Possible. Established scheme. Adjustment would have impacts on the regional “pot”. Possible. To assist key interventions only and to secure a range of wider benefits. May be less acceptable to Hawke’s Bay ratepayers than loans. Possible / Unavailable at present. No fund at present, but if scale of task is great enough there may be a case for approaching Government. Unavailable? Would require expert legal opinion. Proving direct contribution to environmental damage is very difficult. Possible? Would require expert legal opinion. Unavailable? No local government powers at present. Similar shortcomings as regulation of inputs (see option above). Possible. Consenting did not raise environmental impacts. May need assessment. Unavailable at present. Would require a consortium approach. Useful to cost alongside other approaches. Possible / Unavailable at present. Would require strong supporting argument. 1. Structures in the beds of rivers and streams can cause a barrier to migrating fish by preventing their upstream or downstream passage. 2. Pump stations designed to regulate stormwater flows and tide gates and flood gates at culvert openings when closed are a complete barrier to fish passage. Weirs are concrete, stone or stonemesh overflow walls or structures that are designed to raise upstream water level for the purpose of diverting flows or measuring the rate of flow. Weirs are a significant obstacle to fish passage. 3. The introduction of the Freshwater Fisheries Legislation in 1983 and the Resource Management reform of the late 1980s early 1990s. Act in 1991 highlighted fish passage as being a significant issue in New Zealand. The Hawke’s Bay Regional Council sets out clear direction to address this issue through policies and rules in the Regional Resource Management Plan (RRMP). 4. The Hawke’s Bay Regional Council fish monitoring strategy (2006) highlighted the need for an assessment of potential barriers to fish passage in the region. The project aimed to list the location of these potential barriers on public and HBRC managed land and assess each of the structures on the severity of the restriction to particular fish species with differing climbing abilities. 5. New Zealand has a small number of native freshwater fish species compared to other countries in the world. Of the 35 native species included in the fauna, 18 of these spend part of their life in the sea as part of life cycle (diadromous). The presence of structures in waterways has become a problem for some species of fish to migrate between inland waters and estuarine and coastal waters to access suitable habitat to complete their life cycle. 6. The climbing ability of fish differs dramatically between species; the best climbers being the longfinned and shortfinned eels which can survive for extended periods out of water by absorbing oxygen through their skin. Some galaxiid species such as the Koaro and banded Kokopu have evolved with large pectoral fins enabling them to cling to moist surfaces of rocks and allow them to climb extensive waterfalls. The climbing ability of different fish species determines their ability to navigate barriers and penetrate inland. 7. Poor design and installation of culverts is a major problem for fish passage. Culverts installed higher than the natural stream level (perched) can pose a problem for fish to pass through due to the inability for fish to enter the culvert. These perched culverts become inaccessible for all species. Flow conditions inside the culverts can also present a problem for fish passage. Large culverts with a wide diameter become a barrier at low flow conditions due to shallow water depth. 8. A total of 88 structures in 82 separate locations were assessed as preventing the upstream and downstream migrations of the fauna. Of these culverts, storm water pumping stations and weirs make up the majority of the structures identified as causing a barrier to fish passage. Bridge aprons, dams, fords and a recently engineered fish pass at Pekapeka Swamp made up the remaining amount with only 1% of each contributing to the proportion of fish passage types. 9. Information contained in this report will be provided to TLAs, Transit and Department of Conservation to enable review of those structures that are currently inhibiting fish passage. The report will inform consenting to assist in the assessment of new or changes to existing culverts. The report has been provided to the engineering staff for consideration of management options within the environmental management review of council managed waterways. 10. Council is required to make a decision in accordance with Part 6 Sub-Part 1, of the Local Government Act 2002 (the Act). Staff have assessed the requirements contained within this section of the Act in relation to this item and have concluded that, as this report is for information only and no decision is to be made, the decision making provisions of the Local Government Act 2002 do not apply. 1. That the Environmental Management Committee receives the report and approves release of the report to those stakeholders responsible for existing structures. 1. This paper reports on proposals considered under Council’s statutory advocacy project and the Resource Management Act 1991 for the period 27 January – 30 March 2011. 2.5 Non-statutory Strategies and Structure Plans. 3. The summary attached included an actual list and description of the proposals, whether submissions were lodged in support or opposition, and the reasons for lodging a submission. A location map is also attached. 4. Council is required to make a decision in accordance with Part 6 Sub-Part 1, of the Local Government Act 2002 (the Act). Staff have assessed the requirements contained within this section of the Act in relation to this item and have concluded that, as this report is for information only and no decision is to be made, the decision making provisions of the Local Government Act 2002 do not apply. · The application proposes to store stormwater in underground tanks in rain event then discharge into the Jervois drain when the drains levels subside. · The Council has submitted in opposition as the while the stormwater solution is technically feasible it is not failsafe in the long term. The applicant seeks to subdivideLot2 DP 382037 at Pourerere Beach Road to create Lot1 of 9730m2 and Lot 2 of 12.293ha. · The applicant has asked for comments from HBRC before CHBDC has made any decision regarding notification. · Information provided to this Council shows the proposed subdivision boundary line will separate the effluent field (proposed Lot 1) from the septic tank and outlet (proposed Lot 2). Council has provided comment to the applicant suggesting that either the boundary line is moved to include the wastewater system or an easement is lodged against the Title of proposed Lot 2. · It also appears that the system will not meet Rule 27(e)(v) of the RCEP. Notice of requirement for designation to allow for the construction of public works in the Te Awa Structure Plan area by Napier City Council. · The Council’s Engineering Team has provided comment. The Engineering Team believes that the proposed second pump station is unnecessary due to sufficient infrastructure already available in that there is scope to utilise infrastructure previously built for the Cross Country drain. · Council will submit in support but provide further comments on the above. The purpose of the plan change is to rezone the area from Main Rural to Main Residential and incorporate the outcomes sought in the Te Awa Structure Plan into the District Plan. · Engineering Team has provided comments. The proposed stormwater solution does not consider Low Impact Urban Design principles. It also appears that the four Wellbeings of Economic, Social. Cultural and Environment have not adequately been considered in the Structure Plan. · Council will submit in support of the application but provide comment on the above. The applicant seeks to designate land at 139 Arataki Road for Education purposes. The designation will provide land to construct a Primary School and early childcare facility. The site is currently owned by the Arataki Campground. · Proposal has been assessed. No issues warrant lodging a submission. · Detailed site development plans for site layout and configuration yet to be prepared by MOE. Detailed plans to follow if designation approved. The applicant seeks to undertake a 2 Lot subdivision to create one (1) 0.178 hectare residential Lot (being proposed Lot 1) and a balance Lot which will be 3.31 hectares (being proposed Lot 2). The address for the subdivision is 45 Rogers Road, Bay View, legal description Lot 4 DP 7344. · Council joined as Party to Proceedings with the Environment Court opposing the applicants appeal that the NCC decision be overturned. · Received notice of an appeal by applicant against NCC decision seeking that the NCC decision to decline the application be overturned. · Application Hearing held on 24th November, Application declined by NCC. · HBRC lodged submission opposing application. Consent should be declined unless the proposed 2 residential lots are fully serviced or sufficient information is provided to show that adverse effects of on-site wastewater discharges (particularly in combination with the proposed soak-pit means of stormwater disposal), will be adequately avoided, remedied or mitigated. · Submission stated installation of a reticulated sewage system for the Bay View community to be a sustainable long-term solution for the treatment and disposal of wastewater. · Submission also seeks clarification of floor level for flooding risk also requested. The application seeks to subdivide 58 McElwee Street, Jervoistown Certificate of Tile HBM2/1351 into two separate lots. · Council has become a party to the appeal lodged by the applicant under Section 274 of the Resource Management Act 1991. The Council is interested in all of the proceedings but in particular is interested in issues relating to the effects of increased site coverage and stormwater collection, treatment and disposal. · Council has received a Notice of Appeal from the applicant on the NCC decision. · Application was declined at Hearing held 17 November 2010 as it was decided that the creation of two 2000m2 lots was contrary to the intent of the Napier District Plan. · HBRC lodged submission opposing application. o No provision for stormwater disposal and will likely result in adverse conditions in terms of flood levels and duration of flooding at a local level and the wider Jervoistown community. o Proposal to increase maximum site coverage from 10% to 25%. Concern that this will also increase adverse conditions in terms of flood levels and duration of flooding. · A 2009 report prepared by this Council (Jervoistown Drainage Analysis, Hawke’s Bay Regional Council, April 2009) outlines the drainage issues and provides the conclusion that incremental development at Jervoistown will continue to result in reduced drainage standard for the existing houses. A copy of this report was provided to Napier CC shortly after its publication. The application seeks to subdivide an area of land currently zoned as main rural on Franklin Road, Bay View into 6 lots and undertake earthworks. · Policy staff have met with the applicant’s consultant. Options and scenarios for wastewater consenting and servicing are under consideration. · Council submitted in opposition to the application seeking that the application be declined unless all of the 6 Lots were fully serviced. · Comment has been sought from the Regulation and Engineering teams. The stormwater solutions for the site are acceptable due to the free draining nature of the soils. The same soil types present an issue with on-site wastewater disposal and insufficient treatment. Coupled with the proximity of the subdivision to the coastal marine environmental it is likely that the Council will submit against the application. Submissions closed 24 June 2010. This document has been prepared to assist Councillors note the General Business to be discussed as determined earlier in Agenda Item 6. 7(2)(b)(ii) To protect information which otherwise would be likely unreasonably to prejudice the commercial position of the person who supplied or who is the subject of the information. The Council is specified, in the First Schedule to this Act, as a body to which the Act applies.